What is the state o f the access to ICTs for youth in Chad? Which shape has the “digital revolution”, that has heavily influenced social dynamics in Africa, in the central African country? Does the access to the internet and social media open up more opportunities or challenges for the Chadian youth? 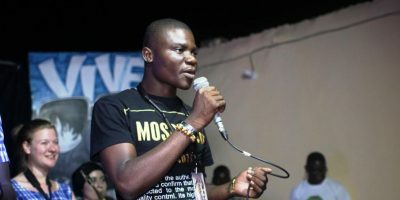 These questions were the starting point for the debate who took place on Saturday 28 October at the Centre Baba Moustapha as part of the programme of the CTD End conference and the festival N’Djam s’enflamme en slam. 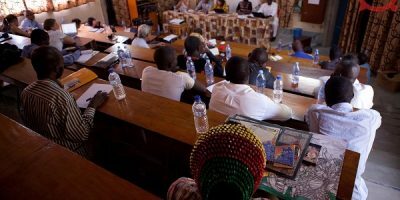 The debate was followed by a participating audience of researchers, bloggers, and civil society and moderated by the CTD project leader Mirjam de Bruijn. To discuss on this crucial points, four speakers intervened: Anonyme, rapper and medical doctor, Emmanuel Dabo, researcher and blogger from Ivory Coast, Archange Marabo, journalist, radio host and football player, and Josué Nékoura Koumnobeye, secretary of press and public relations of the Ministry of Posts and New Information and Communication Technologies. The four participants discussed the question of ICTs and youth in Chad, sharing the crucial role of ICTs in their personal and professional experiences, from music to blogging, from communication to journalism. The debate touched many facets of the issue of access to internet and youth, bringing to the surface many useful points of view. For example, the role of the socio-economical positioning in determining access to the internet, and possible divisive consequences that this might have for the youth. Interestingly, a generational point of view was taken into account, suggesting that the youth’s wish of being connected to the internet might sometimes raise conflicts with their parents. Indeed, the cost of internet connection, particularly high in Chad, plus the lack of understanding of ICTs among older generations, might lead to the perception that spending money for buying data is a “waste” that collides with the best interest of the family. The question of identity was also present in the debate, that touched the point that the expression on Facebook might lead to an alternative form of Chadian identity. Finally, the debate focused on the role of the government. In a country that is still behind in terms of penetration and affordability of the access to Internet compared to many African countries, the government does not seem to make a substantial effort to implement this tool among the youth, suggesting a lack of comprehension of the possibilities that ICTs could open up for the development of the youth. The debate closed with open questions: is this not very comforting scenario of access to the digital mainly a political responsibility, or is it up to the youth to make its way to a better access and usage of the internet? Is the access to the internet a connecting or a divisive factor? These questions were extensively touched when the floor was given to the audience. People presented very nuanced opinions, often sharing points of view on challenges and difficulties based on their personal experience. The event was closed by a performance from the Cameroonian comedian Nana Ardo.